Things I liked: Like the feel and the action nice pistol. Things I would have changed: Having problems with it jamming I don't know if I'm just using the wrong pellets about 2 jams per magazine. Things I liked: The trigger and safety,Trigger works the same way on or off.Great for fine point shots.Great for practice. Things I would have changed: Black would be nice but I do see the camo value in the ugly coyote tan. What others should know: Wish it was BB,no slide open with this horrible pellet rubber magazine feed. Things I would have changed: The only small annoyance, being left handed, is the mag release button is in the way of my hand. I like everything else.Fun shooter. What others should know: Fun six to ten yard shooter. Things I liked: Beautifully made piece. Very realistic in feel and appearance. Great value for money. Reasonably accurate. The best CO2 loading system in the industry. Things I would have changed: Although the pellet magazine works, it's advanced via the trigger pull which makes the trigger this guns Achillies heel. WIth an 8lb trigger pull (this was after working on that pull, it was initially 9+lbs) that's long and gritty, it's hard to predict when the gun will fire. For many this isn't an issue, since aiming a handgun at 10 yards is highly overrated by most pistolero types. These types of handguns are meant to be Point N Shoot as fast as you can, and this gun is capable of delivering on that. However, if you want a highly accurate pistol, you'll want to look elsewhere since the trigger pull on this guy will always be a limiting factor. What others should know: Mounting a laser pointer sighting aide to the Picatiny rail will greatly simplify aiming and certainly improve accuracy. Things I would have changed: I would be like a second magazine. Things I liked: This is a nice replica. Field strip-able and all. Things I liked: This pistol feels and looks just like the real P320 tac-ops that I have shot(I haven't actually shot or held the Army's M17). I did use some sight paint on the front sight and made it green rather than white, but over all it has decent sights. I like how easy the CO2 cartridge is to load as well as the pellets. It seems to be fairly accurate when shooting 10in square steel plates. I can get over 100 rounds out of each CO2 cartridge, but after about 80 the accuracy starts to drop off. Things I would have changed: The length of trigger pull is longer than the actual P320. I would be awesome if it came with extra pellet mags, or at least have them available to purchase. What others should know: It is accurate for what it is, but it isn't "precise". I have been shooting various steel plates and the 3in round plate does because extremely difficult past 12 yards, but I don't have any problems with the 10in plates out to 20 yards. It is a great "tool" that can help with sight alignment and other fundamentals that can aid in shooting the real pistol. Also be aware that you cannot currently purchase extra pellet mags. Once they start offering those, I will surely purchase a few. Things I liked: Everything about this pistol is great! Things I would have changed: Nothing yet. Haven't had enough time with it, but as it stand I wouldn't change anything. What others should know: This is a real time replica. Weight, feel, handling, trigger pull are all realistic. The blowback and slight kick just adds to the experience. Things I liked: Excellent product !!! Things I liked: Looks and weight of gun. Ease of loading. Ease of trigger pull. Very nice pistol. What others should know: Nice price. Fun Pistol. 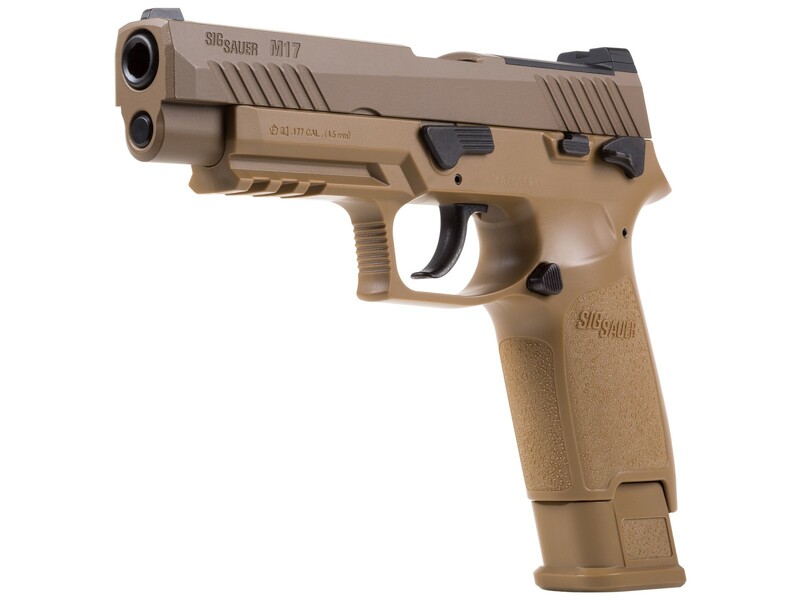 Things I liked: Felt like my M17 - slide action - weight - texture of grip - lower rail for laser sigh fits can move between guns - works well at the range for both day and night practice. Use my holster for both M17 and the pellet pistol for training so works well for training muscle memory. Things I liked: Just bought mines great replica however didn't shoot 430 more like 380 but is there a upgrade kit for m17? that will be great and where would I buy it? YOU MAY WANT TO TRY USEING THE GAMO RAPTORS, ALLOY IN 5.4 GRS. . THNE YOU WILL SEE AN AVERAGE OF 420FPS. I USE WADCUTTERS AND THE LIGHT GRAIN PELLETS IN ALLOY IN MINE AND MY P226. Things I liked: The realistic look and feel and it's pretty accurate. Things I liked: Great gun hit target every time no jams very happy need a second clip. Love look and weight. Things I liked: I like the real-feel and action of the slide, magazine and trigger, but the belt system does jam a lot. You get about 60 shots out of one CO2 cartridge, but when it starts to get low, jams increase. Had problem where pellet jams between belt feed and barrel, making it difficult to eject the magazine to clear the jam.......hence the 3 star rating. Still, Thais is so much better than other semi-automatic pellet pistols I have tried. Best advice is to fire slowly, not rapidly, to avoid jams. Things I would have changed: Belt drive is definitely the way to go, just need to improve on this process to reduce jams. I suspect that jams are more of an alignment of the pellet chamber and the barrel just before firing. Make this more accurate/precise and I think the jams will cease. What others should know: If you are looking for a good, backyard alternative than live fire at the range, this is the way to go. It is about as real as you can get without actually being a 9mm. I HAVE THE SIG, P226 IT HAS THE SMAE BELT FEED MAG THE 226 HAS 8 HOLES AT THE TOP AND 8 AT THE BOTTOM SO 16 ROUNDS AND THEN FLIP THMAG. I HAVE TO MXC RIFFE BELT FEED MAG . I FOUND, YOU HAVE TO USE A NICE FITTING WAD CUTTER ONLY TO PREVENT JAMS. IF IT FITS LOOSE IT WILL JAM. ROUND HEAD, SOME WORK, SOME DON'T. SO I STICK WITH THE WADCUTTERS. I USE RWS THEY FIT SNUG AND DON'T PROTUDE OUT THE FRONT ON THE PELLET HOLE. THIS MAY BE YOUR PROBLEM. Things I liked: This M17 is so much fun to shoot and with time accuracy is great.. Things I liked: Purchased on 23 NOV from pyramyd and received it on 24 NOV. Outstanding. Have discharged 600+ rounds with the last 500+ having NO failures. First 40 shots were with crosman premier 7,9gr hollow point. These fit tight in the belt mag and jammed when firing. Tried gamo match 7.56gr wadcutters next 60 shots. Snug fit and no jams but accuracy was poor. Used meisterkugeln pistol 7.0gr wadcutters next. They preformed very well. Snug fit no jams and good accuracy at 15 to 18 feet. Shot these for the remainder of the 600+ rounds. Shoots a little left. Could be me. Very pleased with this one. The magazine design is great. The Co2 loads with ease as do the pellets. (I used a seating tool and seated the pellets.) Gets 60 good shots per Co2 cartridge in a 67 degree basement. Would highly recommend. If they ever make it black I'll get another one. What others should know: Needs extra belt mag clips, Co2 mag holders for warm Co2 cartridge to extend shooting time and a holster. I would like to see a M17 special edition replica of the one the guards use at the tomb of the unknown soldier. Someone please suggest this to sig. I'm at 1200+ rnds now and have discovered a few things. Still at zero jams at the last 1100+ rnds. Some have experienced a rnd left in the belt mag. This only happens when the shooter short resets the trigger. Doing this will result in a pellet left in the belt. The trigger has a longer reset than most of us are used to with powder burners. Paying attn to the reset length will solve this event. I still recommend using a pellet seater when loading the belt. I really like this replica. Looking for a holster. Things I liked: Everything. Great repro. Nice sturdy weight. Fun to use. Things I would have changed: An extra magazine would be a perfect addition. What others should know: Well worth the investment. With care it can last a long time.